This rubric really is a social construct: class members collaborated (with a great deal of momentum generated by Maury’s contributions) on the beginnings of our rubric. While each of us likely added or removed bits of the collaborative work to personalize the rubric, I’m proud to be part of this socially constructed, class-sourced rubric development process. 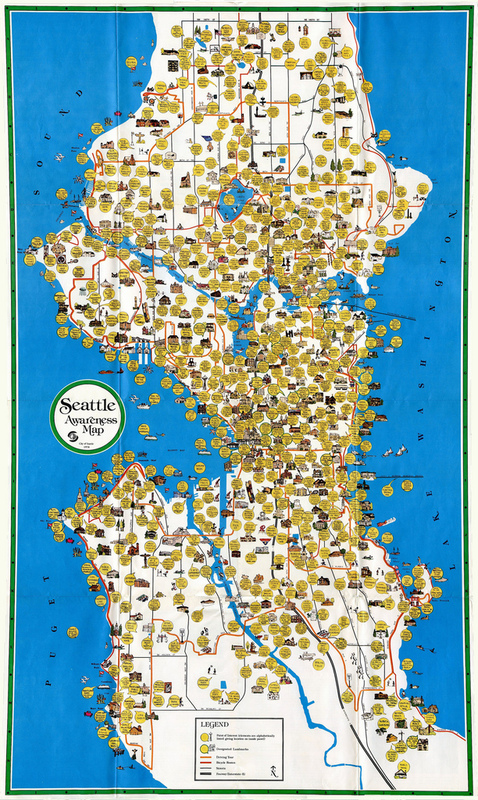 Seattle Awareness Map, 1978: Mapping Seattle’s historical landmarks. Creative Commons licensed image from Flickr user Rob Ketcherside. While we can apply theory to our OoS, I think it’s important to be able to map the theory to localized instantiations of the OoS. If theory can’t be mapped to specific aspects of practice in the field, then it hardly seems useful (in a pragmatic sense) to the field or its scholars and practitioners. Not that every theory needs a Spinuzzi-like operationalized exemplar to be valid — but we need to be able to identify specific ways that teachers in local contexts will be able to apply theoretical constructs and principles to pedagogy, and how scholars will be able to apply theory to specific recommendations for action in the field. We also discussed how or whether to assign grades or points to each aspect of the rubric. Most of us chose to avoid assigning grades: our goal was to develop a rubric that could be applied to both assessment and praxis, and my sense is that assessment needs to be localized at the assignment level rather than generalized at the development level (see Discussion below for more on this subject). As a result, I did not include point values, nor would I want to do so without first sharing the rubric with the person to whom I applied it. Maury applied specific aspects of network construction with Foucaultian theory to LARPs. Below are the results of applying my rubric to her case study. Influential predecessors to the theory to theorist No The assignment did not call for the need to contextualize the theorist among others. Main premise(s) of the theory and key attributes Partially Foucault offers a broad range of theories; those applicable to the OoS were appropriately selected. Limitations of the theory Partially The limitations of the theory may have been demonstrated by absence in the case study. Relationship to other theories in the field and importance to the field No This was not a required component of the assignment. Existing canonical or well-respected applications of the theory N/A The scope of the assignment did not require this level of exploration of the theory. OoS contextualized and explained Yes Thorough explanation of the OoS and its context made it accessible to a complete noob. Theory attributes mapped to OoS attributes Yes Of special note were connection to archive, positivity, absence, and monument. Portion(s) of the theory used and discarded, and why No It’s difficult to nail down Foucault to a single theoretical stance or even set of stances; as a result, this is an appropriate omission. Contribution to understanding or re-articulating the OoS Yes Among the strongest aspects of the case study. Application revealed relational and contingent character of the game’s discourse. Practical benefits of applying the theory Yes Among benefits noted are recognizing the change in meaning that occurs as the game is played. Limitations (blind spots) of this theory as applied to this OoS No Given the broad range of theoretical position Foucault offers, it’s difficult to identify limitations. Additions to the body of knowledge surrounding OoS and/or the discipline Yes The networked description of the OoS via Foucault focuses attention on specific connections within the game, and it broadens an understanding of Foucault’s archive and monument. Local context(s) to which theory can be mapped Yes LARP as distinguished from cosplay, historical re-enactment, creative anachronism, and boffer-style LARP. Specific person(s) responsible for activated mapping Yes Very detailed; notable are Game Masters along with many other actors on the network. Social and political boundaries defined by theory Yes The field of game play is clearly articulated and connected to the field of discourse. Aspects of theory mapped to specific lived experience Yes Another strength of the case study, mapping specific lived experiences of LARP to theoretical aspects. Anticipated social action to be achieved by mapping Yes Closing statement addresses the specific social action expected: multiplicity of discourse emerging from a single LARP. Assessment process of localized mapping defined Yes In the same closing statement, successful mapping with be demonstrated by multiple discourses from a single LARP. The rubric we crowd sourced was intended to address broadly the way a theory is constructed in its time-space and context. Since our assignment was to apply a theory that we had all worked on together in class, neither the assignment nor our execution was expected to spend a great deal of time explaining the key components of the theory, its place among theories, or other contexts related to the theory itself. It was assumed that we’d bring to the assignment that understanding without having to articulate it in the blog post. However, as a hermeneutic, the rubric offers a useful set of tools for assessing and presenting major theoretical aspects to a reader. Of particular importance as we move forward in our case studies will be explaining more of the influential context of the theory — its predecessors, its influences, its turns and negations, its relationship to other theoretical stances. And a conference paper-length application would certainly be expected to use a literature review to place the theoretical stance(s) in appropriate context. As a result, although this case study implicitly precluded most of the contextual background of Foucaultian theory, the rubric itself is likely hermeneutically sound. In the case of Foucault, nailing down a single theoretical stance, or even a set of theoretical positions, is quite difficult. As a result, omitting some of Foucault’s theoretical positions is necessary in anything but a monograph-length study (and even then, I’m not sure). These omissions don’t necessarily mean they don’t apply to the OoS or that there are no mappings between the theory and the OoS. I take these omissions to be practical realities, and would likely consider them so even in a graded assignment (unless major issues were left unaddressed, like statements or discursive formation). That same breadth of theoretical perspective necessitates the OoS itself to define its limits within the frame of theoretical reference. In a more narrowly focused theoretical stance, I’d expect more explicit statements about the OoS boundaries as defined by the theory. In the case of Foucault, I sensed little of LARPs that Foucault would not address. While this was never explicitly stated or even implied in the analysis, the results speak for themselves — there is no shortage of LARP when applying Foucault. As a result, even though the application does not always address every aspect of the rubric, I don’t think the rubric is faulty. I surprised myself in finding the Praxis section of the rubric the most informative and applicable section of the rubric. I found concrete mappings between theory and localized context. I don’t consider this section to repeat the OoS application and explanation section; to me, the object of study is not necessarily localized. In the case of LARPs, for example, the localized mapping went so far as to specify a single LARP (Three Muskateers), while the OoS itself remained a more general discussion of LARPs. However, even this general discussion worked to localize the LARP by differentiating it from other similar activities. My mapping the OoS in lived experience to theory, both LARP and theoretical understanding benefitted. As a reader with no LARP experience, the localized mapping offered a clear theoretical underpinning to the concept and practice of the LARP while clarifying in concrete examples some of the more difficult concepts of Foucaultian theory. Mapping theory to localized experience offered a win/win experience for me as reader, and I believe that same experience applies to extending knowledge and understanding of both fields. 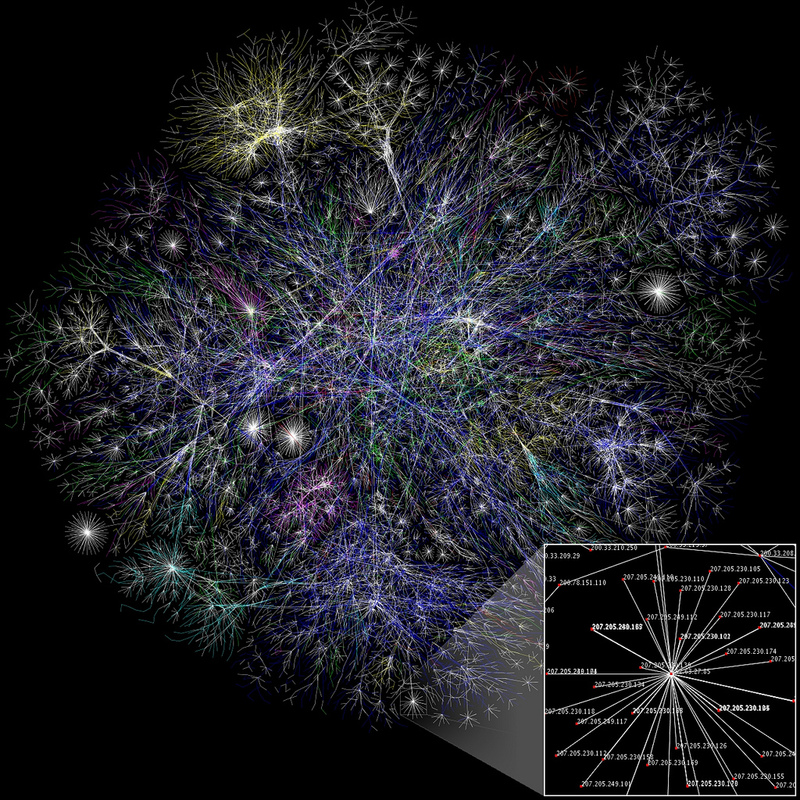 Map of the Internet, 2005: Mapping a global theory to a localization. Creative Commons licensed image from Flickr user Cesar Harada. This rubric, like all others, requires a flexible, local application bound up in real experience. The fact that the assignment did not fulfill all requirements of the rubric makes neither the assignment nor the rubric unsuccessful. The assignment called for different expectations than the rubric (which, of course, reveals in practice the importance of developing rubrics prior to, rather than in response to, assignments), so the rubric could not be fully applied to the assignment. Furthermore, the rubric addressed a broader conception of theory and OoS than the format and length of the assignment could achieve. I believe it’s important to recognize ways the rubric can’t or won’t measure exactly what it needs to measure in each and every instance. Every assignment — and every response to every assignment — is a localization, and each requires a flexible application of the rubric. This does not make the rubric an inefficient or inaccurate measurement tool; on the contrary, it reveals the value and significance of local context in measurement.